Everything that you have, accomplish, own, or do, begins with an intention. 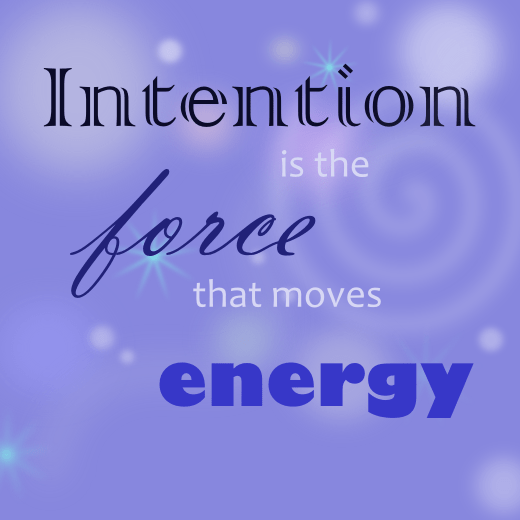 Whether it is aloud, or not, whether it is known or not, whether it is a conscious choice or a subconscious one, intention is the force that moves energy. The goal of most self development work, and Reiki is no exception, is to begin to make deliberate conscious choices in every aspect of our lives. To choose what we focus our thoughts and feelings on is our true power. Much of our day to day lives are driven by instinctual behaviour and habitual thoughts. We respond without thinking and think without reason, we reason without intuition, and we cloud our deep intuitive impulses with numbing behaviours that drown out the very loud, very persistent calling of our souls. Or, at least, that is what can happen if we do not spend the time to turn inward toward your Inner Being or Higher Self, your soul, if you will. Turning inward can be as simple as taking a deep breath; a few moments of meditation in a busy day; a stroll in nature; a gaze and the moon and stars in wonder of the mystery. Quiet times like these are when your deep intuitive voice, your soul’s voice, can be heard the clearest. That wise voice gives you insight, understanding and context to your current life situation. It can provide the wise guidance you need to set an intention that is in your highest and best good. Reiki can help this process of turning inward and focusing on your soul’s voice. As soon as you set your intention, the energy begins.